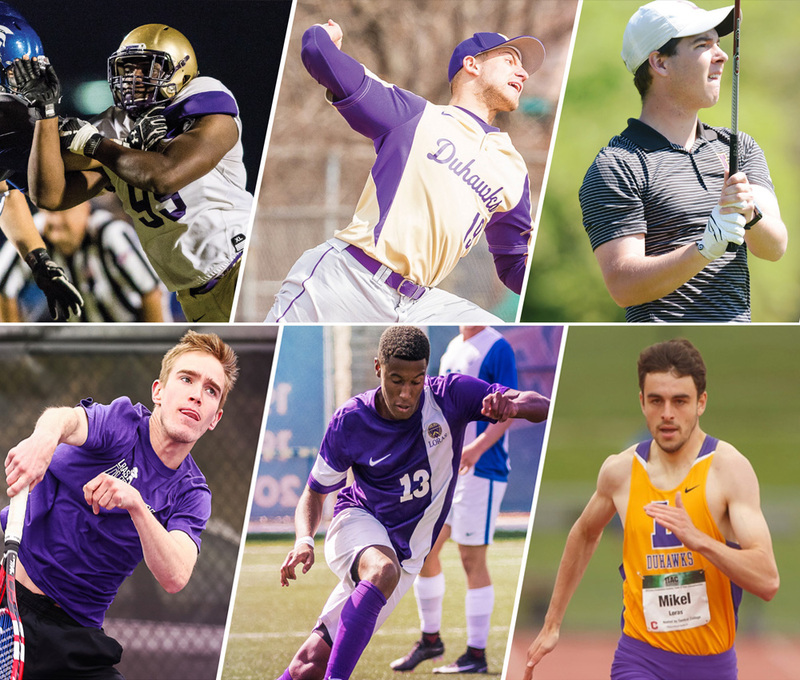 Whether running, kicking, tackling, swinging, shooting or grappling, no one did it better than the Loras Men’s Athletics Program in 2017–18. 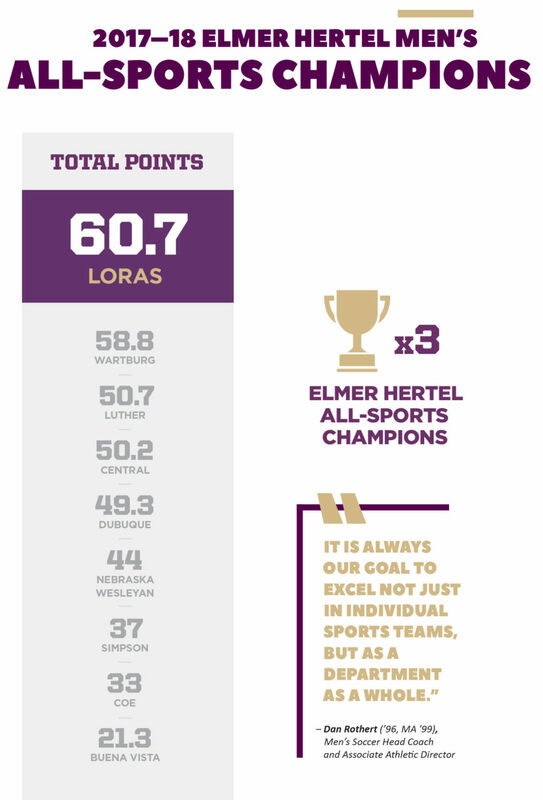 Loras College claimed its third Elmer Hertel All-Sports Trophy in program history by earning the top rank among all Iowa Intercollegiate Athletic Conference (IIAC) men’s programs.  Schools are measured on their achievements in nine sports. Loras tallied 60.7 points, edging out Wartburg College by 1.9 points. First awarded in 1970–71, the Elmer Hertel Men’s Sports Championship Trophy was renamed to honor the former Wartburg coach in 1981. Dr. Hertel served as the Iowa Conference secretary-treasurer from 1944–81. The fall teams got Loras off to a fast start. The cross country team claimed its fourth consecutive IIAC Championship and boasted five top-10 finishers: Mason Tope (’18), Timothy Sevcik (’18), Brien Nugent (’18), Justin Adams (’18) and Jack Carroll (’19). The team would continue to perform well, ending the season with a NCAA Central Regional Championship and a ninth-place finish at the NCAA Division III Championships, the best finish in program history. “The Elmer Hertel All-Sports Trophy is a tremendous reflection of the hard work and dedication of our coaches, student-athletes and staff. 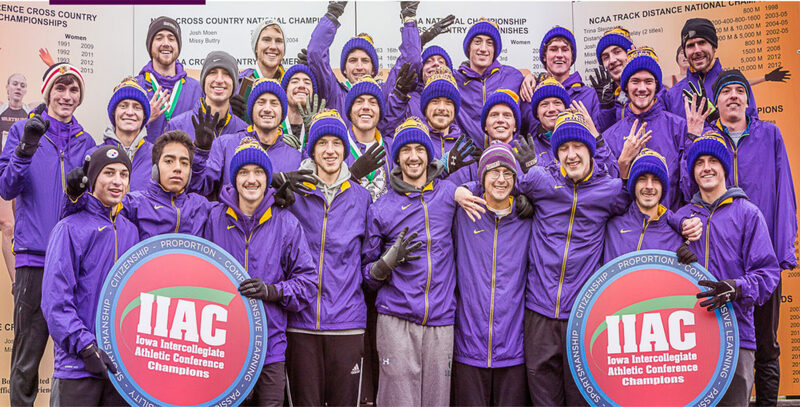 Makes you really proud to be a Duhawk when you accomplish something like that,” said Bob Schultz (MA ’94), head coach of the cross country team. Schultz was named IIAC Coach of the Year and United States Track & Field and Cross Country Coaches Association (USTFCCCA) Regional Coach of the Year. Men’s soccer finished second in conference play before claiming the conference tournament title and an NCAA Tournament bid. It was the team’s 11th appearance on the national stage in program history. Winter sports continued to find success with a pair of second-place finishes by the wrestling and basketball teams. At the 2018 NCAA Division III Wrestling Championships, Guy Patron, Jr. (’20) capped an outstanding campaign with a second-place finish. Jimmy Davis (’19), Kevin Kelly (’19) and Quin Gilliam (’19) also represented Loras on the national stage. Kelly and Gilliam both claimed regional championships in their respective weight classes. 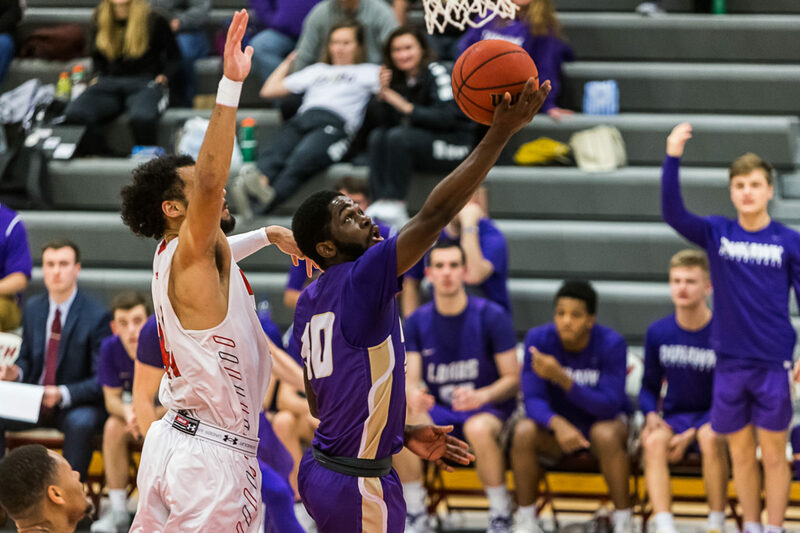 On the hardwood, Josh Ruggles (’19) became the first Loras men’s basketball player to be named to the College Sports Information Directors of America (CoSIDA) Academic All-District team. Both indoor and outdoor track & field teams finished fourth and third, respectively, in conference and were highlighted by record-setting outings by Patrick Mikel (’20), who became the first national champion in school history in the 400m. He was one of 15 men to earn All-Region honors in the spring. 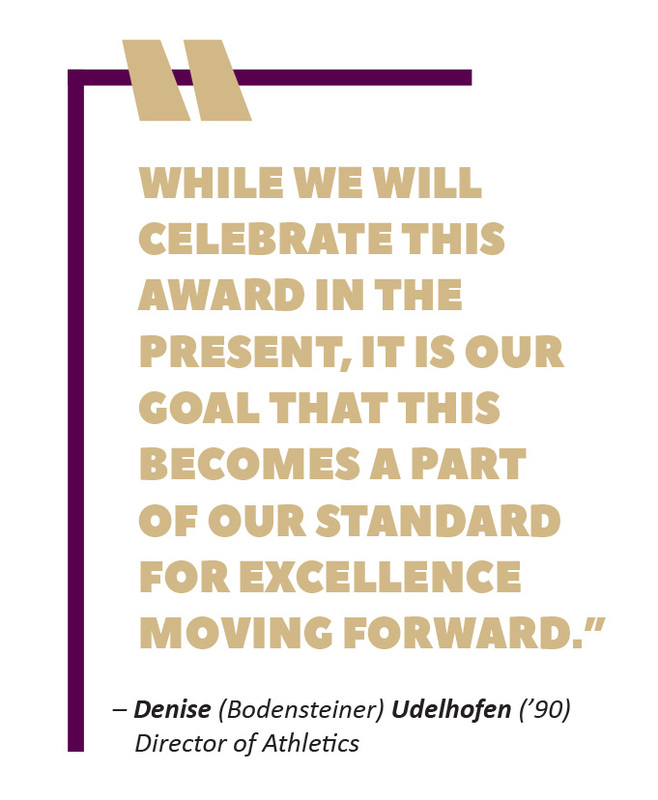 The running programs at Loras added an additional honor by finishing fourth in the USTFCCCA Al Carius Division III Program of the Year standings. The combined efforts of the cross country and track & field teams resulted in the first top-five finish from an IIAC team since the inception of the award following the 2008–09 season. The spring campaigns closed things out with a pair of fourth-place finishes in baseball and tennis, and a fifth-place nod in golf. Loras last claimed the Elmer Hertel Trophy in 1996–97. That same year, the women earned the Marjorie Giles Women’s All Sports Trophy. The Women’s Athletics Program finished fourth in the standings this past year.